SpaceX has successfully launched the Dragon CRS-10 (2) mission carrying a cargo ship for the International Space Station (ISS) following the postponement of take-off on February 18 because of technical problems. Witnesses said the Dragon rocket was only briefly visible before making its way into the clouds. The rocket booster successfully landed on the ground nine minutes after taking off. The touchdown is part of SpaceX’s strategy of returning rockets to earth so they can be reused rather than jettisoning them in the ocean after a single launch. Moments after the rocket landed, the SpaceX Dragon supply ship successfully reached orbit, prompting cheers inside the SpaceX Mission Control room. The Dragon is now making its way to the ISS, and is expected to arrive on February 22. On January 14, SpaceX resumed flights by launching a Falcon 9 vehicle from the Vandenberg Air Force Base on the California coast. It was the first mission by the private rocket company since one of its vehicles exploded on the launch pad in September. The company founder, Elon Musk, wants SpaceX to be at the forefront of the race involving several companies to deploy satellite-based internet services over the next few years. 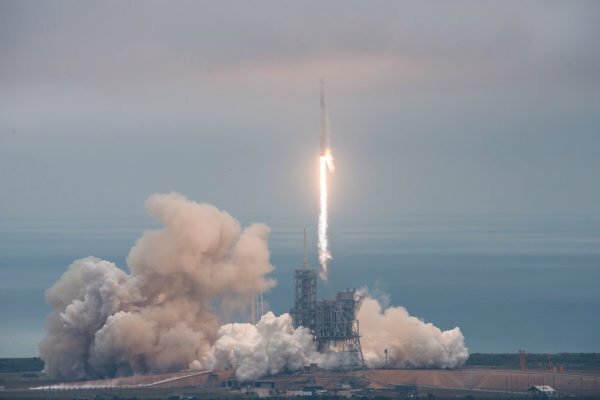 SpaceX also has a long queue of customers all waiting for a ride to orbit – including America’s civil space agency (NASA), the US military and multiple outfits in the commercial sector.